These retail display stands by Berlin designer Till Wiedeck have multiple shelves for presenting monochrome products in the stores of fashion brand COS (+ slideshow). Till Wiedeck, founder of Berlin-based design studio HelloMe, worked with COS to develop units for displaying items across the brand's stores globally. The pieces were created as an extension of Wiedeck's 2012 Critical Objects series of 10 pieces designed as functional sculptures. "COS reached out about developing a bespoke in-store installation for their worldwide retail shops based on our 2012 project Critical Objects," Wiedeck told Dezeen. Object XI and XII both comprise a series of different-shaped shelves arranged at various heights. 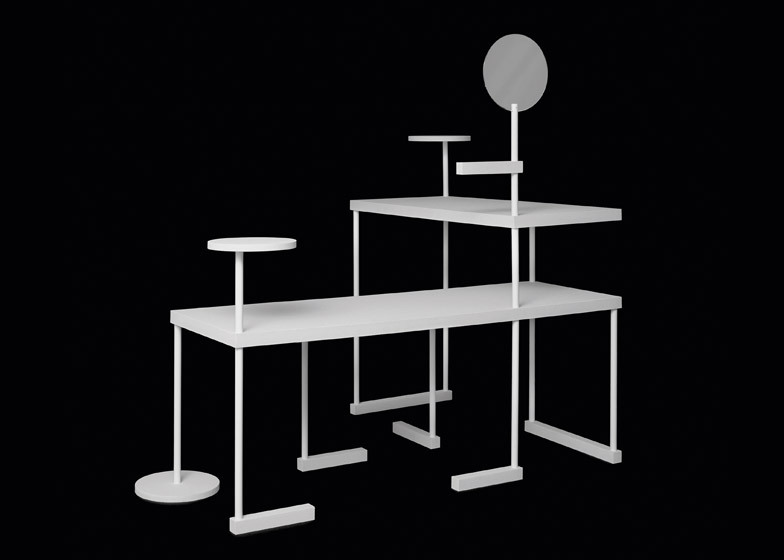 The white Object XI is made up of vertical elements made from tubular steel, which sit on linear or circular wooden feet and support multiple levels of horizontal surfaces. The two largest shelves are rectangular, with one raised above the other and positioned perpendicular to each other. Balanced on the top of the poles are smaller horizontal circles that form further display spaces and a round upright mirror. A hanger also extends from one of the steel stems. To form the flat surfaces, Wiedeck developed a rubber granulate surface that looks similar to Travertine stone but is more durable in a retail environment. "I had the vision to create something that would incorporate a tactile surprise," said the designer. "It took a lot of research until we had a material that met our aesthetic and functional demands." The units are designed to sit within COS stores, where they present a curated selection of black and white products from the brand's range. "The tables needed to be easy to assemble for the visual merchandise teams in more than 100 stores worldwide," said Wiedeck. The brand's larger stores also feature the second Object XII piece designed for the menswear areas, which has a similar but slightly tweaked form and a darker colour scheme. Wiedeck's commission for COS began after the brand spotted his Critical Objects, which includes wood versions similar to his latest designs. COS – which has also collaborated with studios Nendo and Numen/For Use on projects this year – asked the designer to extend his series and create monochrome versions for its stores. "After meeting in London to discuss initial ideas I went back to the studio in Berlin to develop a new concept of a multifunctional sculpture that would meet the needs of a global fashion brand," said Wiedeck. COS managing director Marie Honda spoke to Dezeen about the brand's influences from architecture and design in an interview earlier this year.